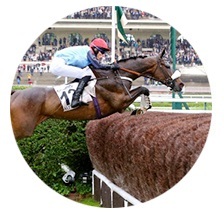 French jump racing takes place all over France, with most of the Jump racecourses located in the North-West of France. Auteuil racecourse hosts the most prestigious events of the Jump racing season, where the big Group 1 contests also attract foreign runners every year. The number of Jump races in France is about 2,200 with around 5,000 individual runners. About 70 million euros are distributed in prize money and 10 million euros in breeder’s premiums.